Aaron is an aspiring young man who has been interested in aviation since childhood. Aaron joined the aviation program at North Shore Community College as soon as he graduated from high school, and he pursued his ratings and licenses as quickly as he possibly could. Aaron graduated NSCC with his commercial pilot’s license and his flight instructor certificate. 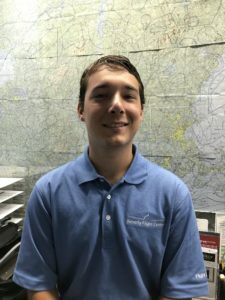 Since then Aaron has been instructing with Beverly Flight Center to help people achieve their goals; from the private pilot license and Beyond to their Pursuits in the multi-engine and instrument world. In the future he intends to continue to feed his passion for Aviation. Aaron’s dream job is to be an aerial firefighter in California, but in the meantime he intends to work for a small Airline or similar operation in order to build experience.